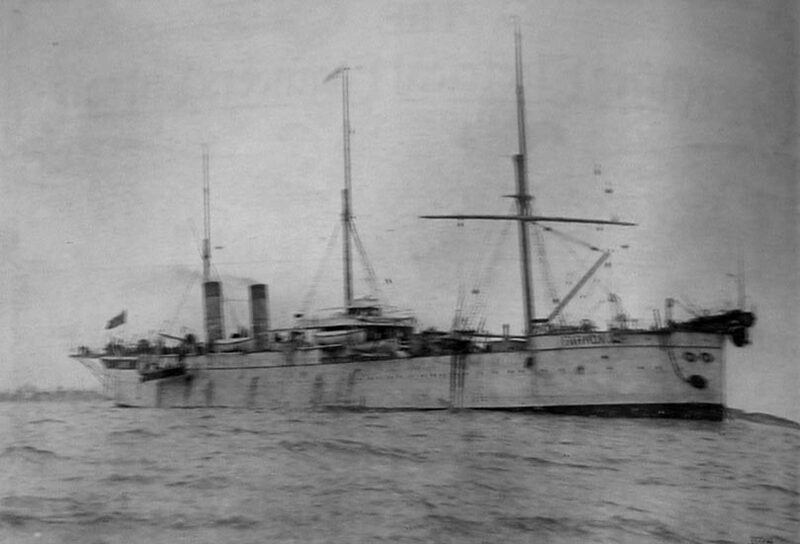 The Newbiggin to Arendal cable, jointly owned by the British G.P.O. and the Norwegian P.T.T., was manufactured and laid by Siemens Brothers & Co. Ltd., London, between October 24th and November 4th, 1910, using CS Faraday (1). It was the fifth cable to link Newbiggin and Scandinavia, previous cables having been laid to Sondervig, Denmark, and Marstrand, Sweden, between 1868 and 1890. 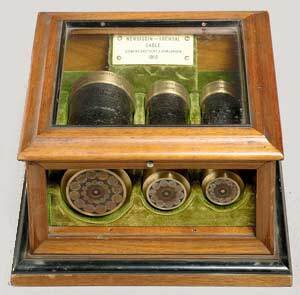 The core of the 1910 cable consisted of a copper conductor of seven strands weighing 200 lb. per knot, covered with gutta-percha also weighing 200 lb. per knot. 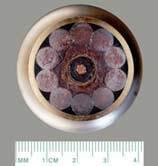 Over this was placed a covering of brass tape wound on spirally to defend the cable core against teredo and other boring worms. Three weights of armouring were used, as shown in the photographs below. The Arendal end was double-armoured. Total length of the cable was 411 nautical miles. The following article on the laying of the Newbiggin shore end of the 1910 Newbiggin to Arendal cable appeared in the Post Office Electrical Engineers Journal, 1911, Volume 3, page 289. On the coast of Northumberland, about twenty miles from Newcastle, stands Newbiggin, a fishing and mining village, which is the landing-place of four submarine cables belonging to the Great Northern Telegraph Company, Ltd., the last cable having been laid twenty years ago. Off this village there arrived on October 24th last, the cable ship "Faraday," commanded by Captain Gange, with over four hundred miles of cable on board, constructed by Messrs. Siemens Brothers, Ltd., and weighing approximately 3000 tons. The new cable, which will provide an additional telegraphic link between England and Norway, is the joint property of the British and Norwegian Governments. 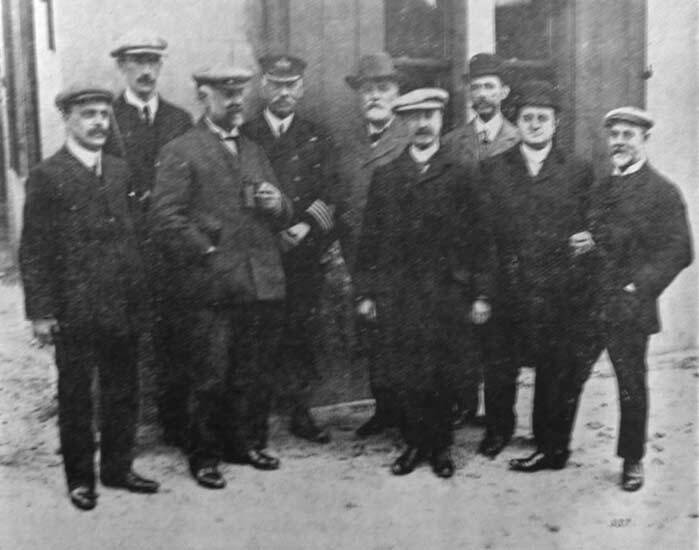 The expedition was in charge of Mr. W. Dieselhorst, of Messrs. Siemens, who was accompanied by Mr. W. R. Culley, I.S.O., superintendent of the Post Office Submarine Department, representing Major O'Meara, C.M.G., Engineer-in-Chief. 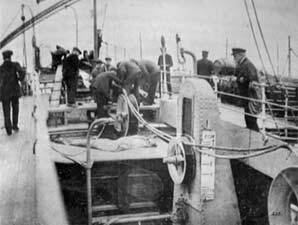 For two days the North Sea proved too rough to permit of landing operations being commenced, and the monotony of waiting was only relieved by the casting ashore of a derelict boat. Whether the latter had merely broken from its moorings, or had been washed ashore as the result of a disaster, could not be determined. On the 26th the weather conditions had improved sufficiently to permit of a start being made, and work was accordingly commenced at daybreak, and continued until darkness set in. By that time the end of the cable had reached the Great Northern Company's cable-house, and arrangements were then made for completing the shore work on the following morning. The English end of the cable. 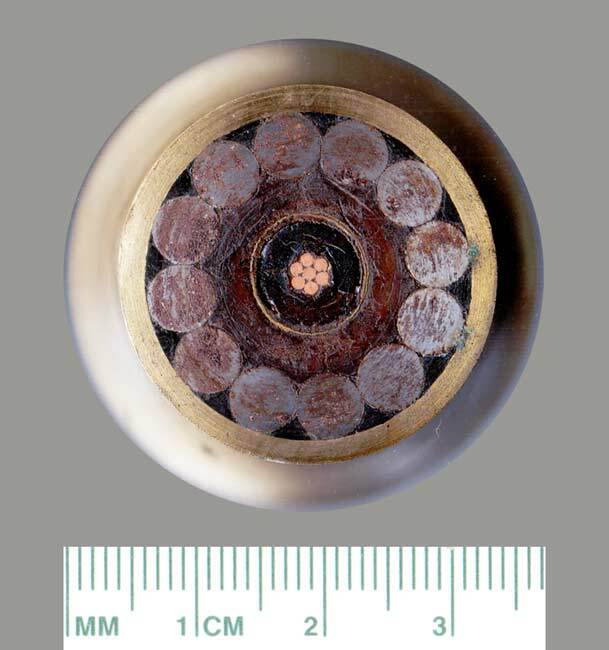 To those who have not witnessed submarine cable laying, it may be of interest to explain that the method of bringing the cable ashore differed from that adopted in the case of the Dover cable, which was described in the July number of the JOURNAL. 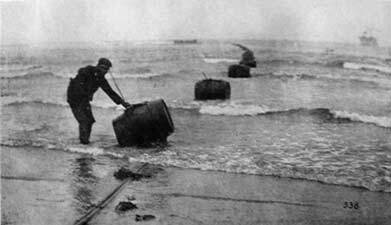 Reference to the article mentioned will show that there the cable itself was rafted ashore, that being the method usually adopted in the British Post Office Service. 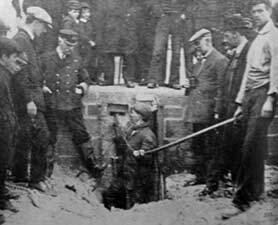 At Newbiggin, however, a hauling rope was brought ashore on a raft and passed through a sheave or pulley secured to a wooden frame buried in the sand. It was then carried through a second sheave, placed about 150 yards from the first, and, thence back to the ship. In this way the coming and going portions of the rope were kept apart, and as one end was drawn into the ship by the engines, the other end, to which the cable was attached, was pulled ashore. As the cable passed from the ship to the water it was lashed to empty barrels placed at suitable intervals, and was thus kept afloat. The operations were directed by Mr. Dieselhorst, assisted by Messrs. Eliot and Stopher, while assistance in the work of burying the cable was rendered by a Post Office gang, under the direction of Mr. G.E. Gilpin. The cable house and the arrangements for accommodating the cable were in charge of Mr. W. F. Borck, the Great Northern Company's superintendent at Newcastle. On the 27th, owing to the heavy sea, the work at the shore was carried out with some difficulty; and by the time it had been completed the sea had become so rough as to render it unsafe for the men to attempt to rejoin the ship. 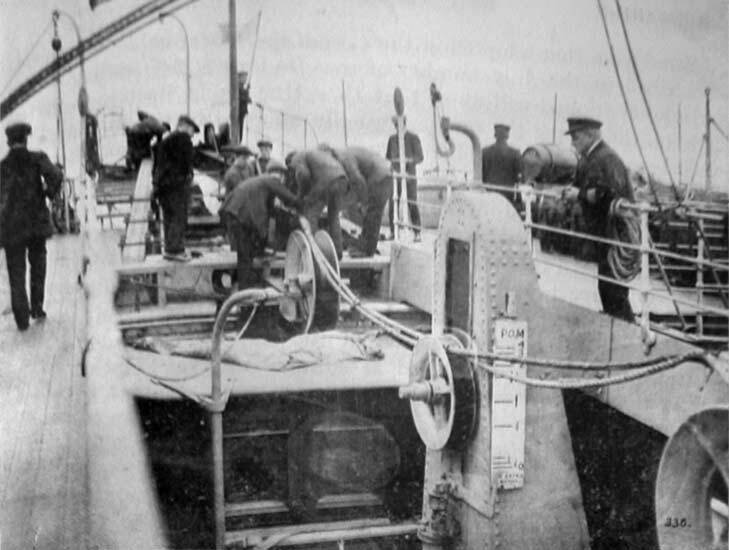 On the same day the local fishing fleet was understood to be in danger, and the lifeboat was launched, and remained out for about two hours to render assistance if required. During the storm, the cable was cut and buoyed at a distance of about two miles from the shore. These weather conditions prevailed until the 30th, when the sea moderated and the men were enabled to rejoin their ship. 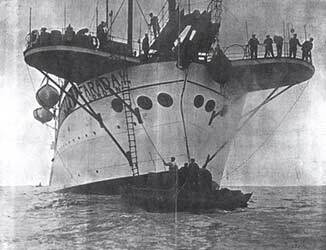 The cable-laying was resumed and the "Faraday" headed eastward, accompanied by the best wishes of all on shore for a successful voyage. It is satisfactory to record that these wishes were realised, communication between Newbiggin and Arendal being established on November 4th. A group of officials connected with the laying of the new cable from Newbiggin to Arendal in Norway. Left to right: Mr. W.G. Hilyer (G.P.O.Engineer), Mr. H.S. Elliott, of Siemens (the contractors), Mr. W. Dieselhorst of Siemens (who is in charge), Mr. W.R. Colley, I.S.O. (Supt. of the Submarine Telegraph Department), Mr. C.F. Horck (Supt. of the Great Northern Telegraph Co., Newcastle District), Mr. J. Robb (Superintending Engineer, G.P.O., Newcastle), Mr. G.E. Gilpin (Sectional Engineer, Newcastle District), Mr. F. Mosley (Asst.-Supt. of Great Northern Telegraph Co., Newcastle), and Mr. W. Graham, Chief Electrician to Siemens. The core consists of a copper conductor of seven strands weighing 200 lb. per knot, covered with gutta-percha also weighing 200 lb. per knot. Over this is placed the covering of brass tape wound on spirally. Capacity per knot 0.3642 m.f. The wires required to connect the cable with Newcastle are in course of construction, and by the time this Journal is in the hands of its readers the opening of the line between Christiana and Newcastle will probably have been announced. We are indebted to the proprietors of the "Newcastle Chronicle" for permission to reproduce the accompanying illustrations. Editor's note: The cableship Faraday, described and illustrated in this 1911 article, is the Faraday(1), built in 1874 and remaining in service until 1924. WILLIAM JOHN GRAHAM, who was born on the 4th June, 1856, and died on the 23rd January, 1927, was one of the oldest members of the Institution. He was elected a Student in 1872, an Associate in 1876, and a Member in 1898. After being educated at the Greenwich Proprietary School he, at the age of 16, became a pupil of the late Samuel Edmund Phillips, then chief electrician to the firm of W.T. Henley. 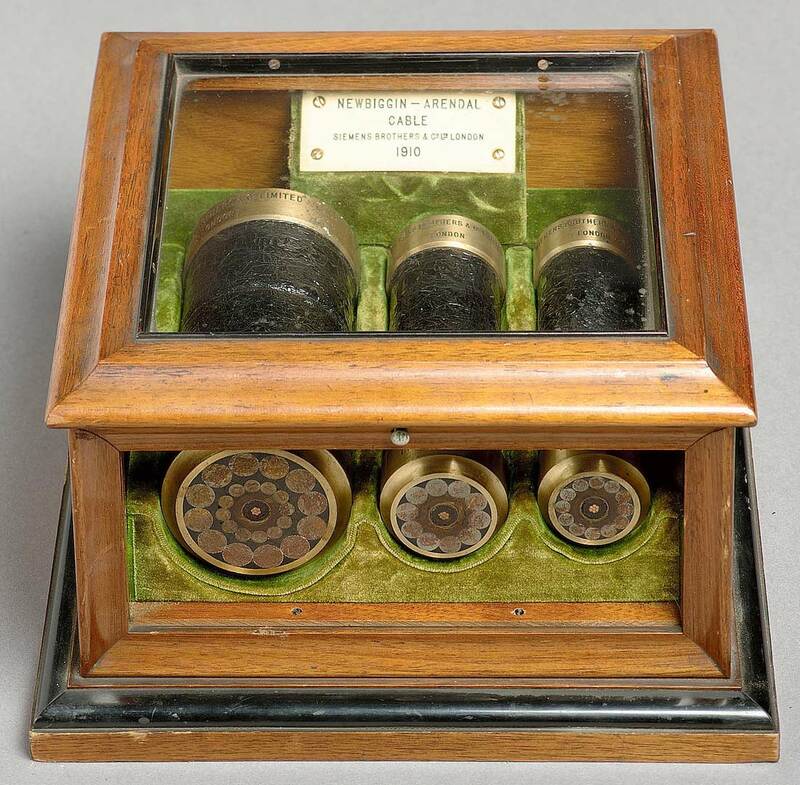 At this time the period of rapid development of sub­marine cable telegraphy had commenced, and at the early age of 19 Mr. Graham was in China installing telegraph stations on the Yangtse River. He remained in China about two years. After his return he became connected for a time with the French Atlantic Cable Co., and later was in the service of Messrs. Greener, inspectors to the India Office. In 1881 he joined the staff of Messrs. Siemens Brothers and Co., in whose service he remained until his death. During the greater part of this period he was prominently connected with almost every cable expedition undertaken by the firm, either in charge of the electrical department on board the C.S. “Faraday” or in charge at the shore station during laying operations. 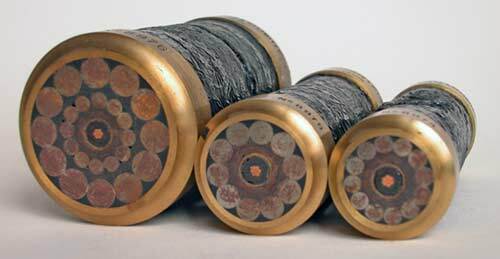 The total length of these cables was between 27 000 and 28 000 nautical miles. After 1913 he ceased to accompany the laying expeditions, which he had regularly done, as chief electrician since 1901. He continued, however, to attend to his duties in the cable works, with the conscientious thoroughness which had distinguished his life. Under a somewhat stern exterior and inflexible devotion to duty he had a most kindly disposition which was probably best known to those who had been his assistants during dreary watching in cable huts, more often than not on lonely, barren coasts. His life story is an epitome of the history of submarine cable development. 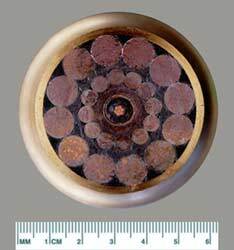 Anyone with further information on William John Graham and his work in the submarine cable industry is invited to contact Alan Graham through the Atlantic Cable website.